Groundwater Availability Models (GAMs) play an important technical role in managing aquifers and can play an important role in managing surface waters. Most GAMs are weak in modeling the interaction between groundwater and surface water. As such, the predictions from these models have been down-played by groundwater conservation districts, their consultants, and State agencies involved in the regulation and management of groundwater pumping. 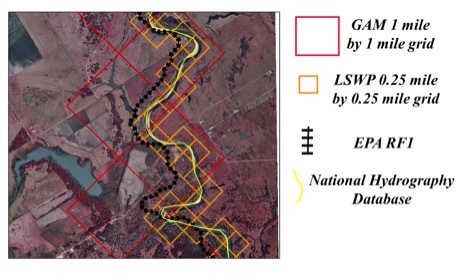 Having a robust model will provide a strong tool for developing an understanding of, and quantifying, the relationship between the Colorado River and the Carrizo-Wilcox Aquifer Group in GMA-12, and particularly in Bastrop and Fayette counties. Click here to review INTERA’s RFQ Proposal. GAMs are built around grid cells that represent specific areas – at the surface and below the ground – within the geographical area where aquifers are located. These grid cells are typically 1 mile X 1 mile in size at the surface and extend to the bottom of the aquifer below (which can range from tens of feet to thousands of feet). The key revision to the mode that will enable a more robust ability to predict the impact of groundwater pumping on surface waters – rivers, streams and springs – is revision of the grid size down to ¼ mile X ¼ mile in and around the Colorado River and its tributaries in the GMA-12 region. A further refinement will add horizontal layers near the surface to better represent surface water features and surface interactions. The combination of these two improvements provides the ability to separate the location of pumping from the location of monitoring wells, river and stream gages, springs, and other features that better describe and quantify surface waters. Figure 1. Comparison of the approaches for representing the Colorado River based on EPA RFI dataset and the National Hydrography dataset and based on a 1-__mile grid cell and on a 0.25-__mile grid cell. What will the improvements do? The GAM improvements will allow a better understanding of, and quantification of, the relationship between the Colorado River and its tributaries with Carrizo-Wilcox, Sparta, Queen City, and Yegua-Jacksonaquifers. The Carrizo-Wilcox Aquifer Group includes the Carrizo, Calvert Bluff, Simsboro and Hooper aquifers. The Sparta, Queen City and Yegua-Jackson aquifers are important aquifers in the southern portions of Bastrop County and northern portion of Fayette County. As such, these GAM improvements will also enable better understanding and management of these other aquifers too. Historical data gathered from instream studies indicate that the Colorado River gains water from the aquifers as it flows through Bastrop and Fayette counties. In hydrological terms, this means that a portion of the groundwater found underneath these counties flows out of the aquifers – known as outflows to surface waters – and into the river and its tributaries by way of springs and underground connections. What the current GAM predicts. The closer to the river, the more the impact. The greater the quantity of pumping, the more the impact. And finally, the longer the pumping, the more the impact. What the current model does not accurately predict is the timing and quantitative impact of these trends. For example, the model does not accurately predict the year in which the impact of 20,000 ac-ft/year of pumping at a particular location will reduce the quantity of outflow to surface waters by 7,000 ac-ft/year. 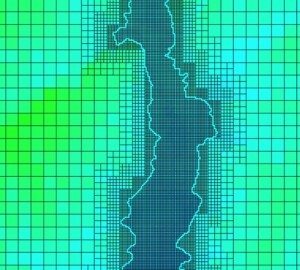 This type of quantitative information is important to inform management decisions made by regulatory authorities such as groundwater conservation districts and river authorities. This information is also important in informing the legislature as it considers public policy decisions and legislation. If we are to balance the impact of developing our aquifers against the responsibility to conserve and protect our water resources – as required by the Conservation Amendment to the Texas Constitution and Texas Water Law – we must have better information on these topics to inform regulatory and policy decisions. These improvements to the GMA-12 GAM will help provide the information needed for better informed decisions.